The following is a repost of a July 2018 article with updated information about the hottest spots in the fabulous French city of Bordeaux. If you've never been to the city of Bordeaux, start packing your bags. Now is the time to go. Stop in for a glass of famous Bordeaux wine at one of the many outdoor cafés. This charming, walkable city has gone through a major urban renewal during the past fifteen to twenty years. Most of the historical monuments and buildings have been scrubbed clean and, with the installation of a quiet, modern tram system, cars are banned from many of the grand avenues. It's no wonder that this UNESCO World Heritage Site is frequently listed at the top of the "European Best Destinations" list. All around Bordeaux you’ll find beautifully designed parks and gardens that invite you to step in, take a stroll and relax. The two-mile long promenade alongside the Garonne river is the perfect place to go for a run, a bike ride, or a walk, stopping along the way for a glass of wine at one of the riverside cafés. Or head to the Place de la Bourse, Bordeaux's most splendid square, just off the promenade. Here you will find a 'Water Mirror,' the world’s biggest reflecting pool with water mists that turn on every 15 minutes during the summertime. Interested in shopping or art? There are many quaint neighborhoods — a favorite is Saint-Pierre — with its winding streets dotted with all kinds of boutiques like Pablo for women’s clothing (7 Rue Montesquieu) and idk-lé for shoes and accessories (19 Rue du Pas-Saint-Georges). Then there are the art galleries, and museums. The Museum of Contemporary Art, is well worth a morning’s visit (you probably need only an hour or two) to take a look at the old, charming warehouse it is housed in, and to check out the many temporary exhibits. The Musée d'Aquitaine, on the other hand, is a delight for history buffs who want to dive into Bordeaux’s lengthy past, from the Stone Age to today. Many of the relics date back 25,000 years and are displayed in a bright and well-curated space. The Cité du Vin (Museum of Wine) is a high-tech immersion into the world of wine. The gorgeous Château Cos D’Estournel in the Saint-Estèphe appellation of the Médoc. But what about its famous wine? The word Bordeaux is synonymous with deeply colored red wines that are made by blending grapes, usually cabernet sauvignon and merlot. The Cité du Vin (pictured above) is a must-visit for wine lovers with interactive exhibits focusing on winemaking around the world. But, there’s no better way to experience the wines of Bordeaux than a visit to the place that the grapes are grown and the wine is made. A trip to Bordeaux would not be complete without at least a day visiting the historic, countryside chateaux. You can rent a car or hire a driver, and within an hour's time, you will be hobnobbing with Bordelais winemakers, touring vineyards and tasting delicious wines. And the best thing about returning to the city after a day in the countryside, is that a thriving restaurant scene awaits you. Casual wine bars, cafés and bistros, elegant tasting-menu restaurants, you'll find them all in Bordeaux city. Bon Voyage! Pool party decor in the restaurant and Bar at Mama Shelter. Lunch hours in Bordeaux are usually only from 12:00 - 2:00 p.m and dinner doesn't start until 7:00 or 7:30 p.m.
Mama Shelter - Located smack in the historic center of town, this fun and trendy hotel, designed by Philippe Starck, has a hopping restaurant and a very popular bar. During the warmer months, you can drink the creative cocktails on the outdoor rooftop terrace while enjoying the fabulous views. I didn’t eat dinner here, but the breakfast buffet was excellent. Stop by for an after-dinner drink or an aperitif before dinner at one of the following restaurants. Le Petit Commerce - 22 Rue Parlement Saint-Pierre. 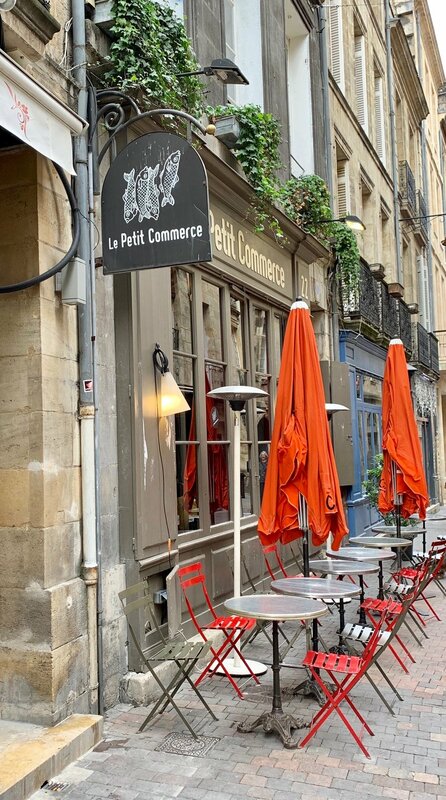 You won’t find fresher seafood than at this charming, casual bistro set on a narrow, winding cobblestone street in the heart of Bordeaux city. Outside Le Petit Commerce with the owner and his fresh catch of the day! La Brasserie Bordelaise - 50 Rue Saint-Rémi. This charming restaurant is on one of the oldest, busiest streets in the historic heart of Bordeaux and caters to both tourists and locals with its convivial atmosphere and nice selection of meats and seafood. Oysters in Bordeaux come from the cold waters of nearby Arcachon and are so briny and delicious! L'Univerre - 40 Rue Lecocq. One of the best wine lists in all of Bordeaux can be found in this simple and elegant space. The wine list presents choices from all over the world, but mostly French, and there is a well-done dining menu with several French classics like quenelle de crochet with sauce nantua. After spending an evening here and watching the care and attention they take with the wine, it made me feel like coming back to New York and opening a wine bar just like it! Champagne in Bordeaux. Mais Pourquoi pas?! The best dessert at L’Univerre: Mille-feuille with vanilla bourbon cream. Le Carreau - 30 Rue du Pas-Saint-Georges. This French brasserie has a bustling, energetic atmosphere and offers many dishes inspired from the cuisine of southwest France: Duck, blood sausage, foie gras. The menu is handwritten on large blackboards and includes lighter fare like soups and salads. Le Carré - 1 Place du Marché. Located in the hip Chartrons neighborhood, this is the brother restaurant to Le Carreau. The food is a modern take on French Brasserie dishes and the place is always busy. The service is friendly and attentive and, when I was there, the waiter brought over a large blackboard with its French menu and went over each dish with me, making sure I understood how the dish was prepared. El Nacional - 23 Rue Rode. Also in the Chartrons area, this lively, casual Argentinian restaurant, popular for both business and family dinners, is known for its high-quality meats and extensive list of Argentinian wines. Bistrot du Fromager - 73 Quai des Chartrons. The aromas of pungent cheeses waft your way the moment you you walk into this modern-looking, casual and lively restaurant overlooking the river in the Chartrons district. The cheeses are lined up on display along the left and on the right are several tables full of people drinking wine and eating cheese. During the warmer months, there are tables outside to enjoy people-watching along the Quai des Chartrons. La Tupina - 6 Rue Porte de la Monnaie. A casually elegant spot and one of my Bordeaux winemaker friend's favorite restaurants. Try the black pig dish and the octopus. Closed on Mondays. Le Hangar Darwin - 87 Quai des Queyries. Recommended by Pauline from Chateau Haut-Rian, "An interesting part of Bordeaux, on the other bank. Hip vibe and a great place for brunch." Point Rouge - 1 Quai De Paludate. Similar to L'Univerre with a great wine list. It also has an excellent cocktail list which is hard to find in Bordeaux. Closed on Mondays. Vins Urbains - 27 Rue des Bahutiers. 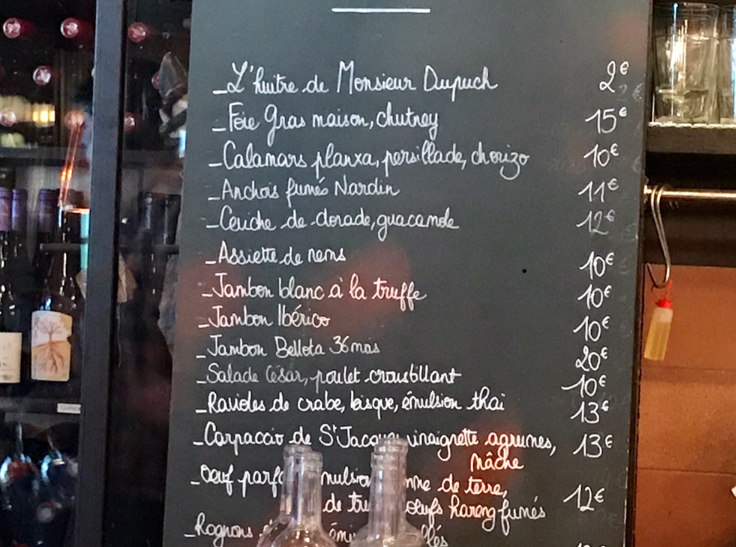 From my friend Marcus, another Bordelais, "Very nice wine spot in old Bordeaux city center for sipping and snacking." Closed on Mondays. One of hundreds of beautiful doorways in Bordeaux.